Speidel Plastic Fermenter - 100L / 26.4 gal. I have 35 gallons in six glass carboys and want to get the wine in one container to save floor space. needed a bigger one.....have a 60L as well. Awesome product! Need to make MORE BEER! hoping to make 20 gallon partial mash batches with less work. Is this any good for primary fermentation? BEST ANSWER: Yes. I bought it as both a primary fermenter and a storage tank as my needs dictate. The lid has an O-ring seal and it has an airlock. When using as a storage vessel, the airlock is replaced with a sealed cap. YES! I use this for 20 gallon partial mash batches with a single stage fermentation. After one week I add dry hops for another week and keg at the 2 week mark. It is extremely easy to clean and sanitize and since (for me) it replaces 4 bucket fermenters and 4 carboys and 8 airlocks, it has greatly reduced my workload and decluttered my brewing space. I put it on a cart so I can roll it inside or out depending on weather or brewing needs. I don't know how I got along without it. That largely depends on what features you're looking for in a Primary fermentation vessel. You could primary ferment in a bowl on your counter. These have a good sized airlock and a spigot that will drain above the lees. A more conical vessel is more ideal for primary in general. Jeff, I probably wouldn't use this for primary fermentation. It is somewhat difficult to clean, and may retain off-odors. Best to use glass or stainless steel for that. I did store a cuvee for a sparkling wine in it this winter; it was excellent for that purpose. Been working very well for me as one of my primary fermenters. Easy to clean and portable. Thought I'd be worried about the handles, but they are well made and durable. Out of necessity, I have used them for primary fermentation. Everything went very well and I was pleased with the wine. Yes, we use them for primary fermentation. They work great. Great for aging wine, or use as a holding tank. Easy to clean. This is a great container for fermenting or storing wine. Unlike the older, round Speidel containers, the cover is sloped so that no air gets trapped inside. However, I intially hesitated to buy this tank for a very long time because MoreWine states the weight to be 75lbs which is way too heavy to easily work with. The tank actually weighs about 10lbs (maybe there's a decimal point missing...). In addition, the volume of the "100L" I purchased was actually 110L, which caused me to scramble the first time I filled it up. I purchased several of the 100 liters these this fall and now have 5 total in use. Light weight, really easy to clean, extremely functional. Being rectangular, not circular, they take up so much less room! 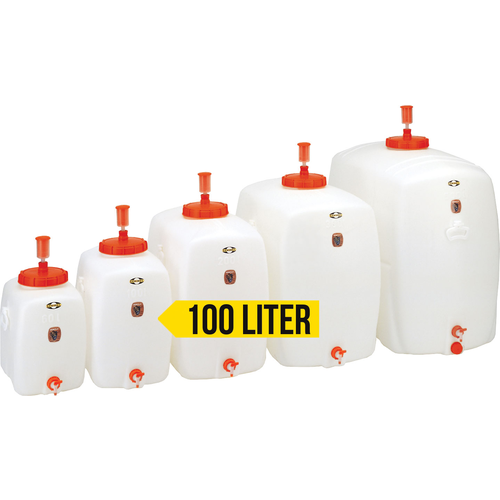 Also, the 100 liter can be delivered by the Fed Ex, UPS, or USPS and the rate is dirt cheap! Seems like Speidel is right on the mark with the design of these!